CANopen® is an open, CAN-based communication protocol. 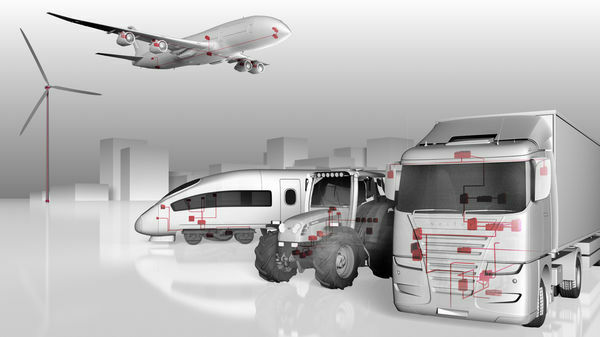 Its wide range of application includes the areas of transport and control technology, measurement systems, medical technology, railway technology, maritime applications and much more – in short where ever great flexibility and rapid data transmission are in demand. The specification is built on the experience of many component manufacturers and users, resulting in a well-established standard that is maintained by the CAN in Automation (CiA®) user organization. CANoe .CANopen coupled with the project-planning tool ProCANopen (included in delivery) enables efficient planning, management, simulation, test, and startup of CANopen networks. During the system design phase you have the opportunity to simulate the later behavior of a system, estimate the bus load, and draw conclusions, like the necessary hardware performance. CANoe supports you through extensive CANopen specific functions. The required training and concentration on the CANopen protocol can be kept at a minimum. The use of CANoe .CANopen leads to an increasing integration quality, while reducing costs significantly at the same time. This functionality reduces necessary steps to the definition of defaults– without having to carry out a concrete implementation manually. Effort and error rate is greatly reduced. Using in parallel the options .J1939 and .CANopen, CANoe is the ideal development and test environment for the CiA DS-413 CANopen Truck Gateway. Along with the base tool CANoe, CANoe .CANopen also contains the ProCANopen configuration tool and the CANeds EDS editor. In developing a CANopen network, you as an engineer are confronted with many different communication-related tasks before you can turn your attention to the actual application. Besides design of the object directory, PDO relationships must be defined and the CANopen network must be started up to check its functionality. CANoe.CANopen gives you valuable assistance with these tasks and will contribute to the success of your CANopen project development. A key aspect of CANoe .CANopen is automatic generation of device models out of ProCANopen based on standardized EDS files. These models are integrated in the simulation environment and executed there. The application-oriented, C-based language CAPL (Communication Access Programming Language) from Vector serves as the programming language. All information necessary for the generation exist in the device descriptions that are set up using ProCANopen. One CAPL program is generated for each ECU to be simulated. This program contains the basic framework for ECU functionality. These are event functions that can be filled with application-related behavior. The interface for the application code is created so that the code can be written independent of changes in communication. When changes in the communication characteristics are made in ProCANopen, only the program sections relevant for the CANopen communication are changed; the application simulation remains unchanged. The entire CANopen-specific functionality of an ECU is implemented by special CAPL functions. This makes it very easy to initiate an SDO access to another device in the network from the CAPL program. In addition, a whole series of event functions are created during generations, which are called during the simulation. User defined panels can simplify usage of the CANoe CANopen simulations in a fundamental way. The Panel Designer, which is part of any CANoe installation, allows direct mapping of objects from the object directory of simulated CANopen nodes to panel controls. Using controls like buttons or text boxes, direct and easy access to objects is possible without knowledge of their communication properties. It is possible to display or control objects that the simulated nodes exchange with real CANopen devices without further efforts. In a Trace window the CAN message traffic is displayed while simultaneously interpreting the protocol information it contains. The user not only sees which service is currently being executed, but can also examine all relevant service parameters. This information is displayed in clear text. To simplify analysis, CANopen services are distinguished by different font colors and background colors. The user gets a quick overview of the chronological order within protocol sequences of the observed CANopen services. This makes it significantly easier to locate errors in a real system. Refined search functions and filter options ensure that you maintain a clear overview even when there are many different messages. CANoe .CANopen also monitors for the correctness of individual protocol sequences. This involves detecting whether the protocol information was properly entered in the CAN message. To ensure that the described device information is also available in CANoe .CANopen, just add a CAN database that is automatically generated in a ProCANopen project. Messages or process data can then be accessed symbolically in CANoe .CANopen. Not only the Trace window, but also the familiar Data and Statistics windows of the standard version of CANoe are available for the analysis of CANopen data. in addition, the CANopen Scanner evaluates CAN messages and shows the active nodes in a list. It displays other node-specific information as well, such as the node state or device name. CANopen-specific message sequences can be assembled within a dialog. You select and configure the desired messages (PDOs, SDOs, etc.) from a project-specific list and assemble them into a sequence. The sequence can be replayed once or periodically. This means that message sequences can be sent to the connected devices as often as desired. Included with the product CANoe .CANopen is the project planning tool ProCANopen and the EDS editor CANeds. CANoe .CANopen contains ProCANopen to enable efficient and quick planning of complete CANopen networks as well as devices. You are supported in all project phases, including planning, development, start-up, and service. Through the extensive functions, combined with an intuitive user interface, you can concentrate immediately on the definition of the system parameters. ProCANopen executes the concrete and CANopen-conforming implementation of projects automatically. This significantly reduces the configuration effort required for extensive systems. The quality of the configuration thus created is increased, which in turn increases security of the system. The editor/generator CANeds is a tool for creating and testing EDS files. CANeds takes over the difficult and error-prone task of creating EDS files manually. CANeds enables device manufacturers and system integrators to avoid problems when working with corresponding CANopen configuration programs. Creating EDS files is very easy due to the ability of accessing standard objects and their attributes via CiA-CODB databases. CANeds displays the structure of an EDS in a hierarchical tree structure and represents CANopen object attributes such as object and data types symbolically. CANoe .CANopen provides a variety of possibilities for simulating, developing and testing CANopen systems. But only those who are familiar with these options can fully tap the potential and save time and money. Take advantage of our training and education offers in order to make even more efficient use of CANoe .CANopen in your day-to-day work!